FILE - President Barack Obama makes a statement on Wednesday's mass shooting in San Bernardino, Calif., in the Oval Office of the White House in Washington, Dec. 3, 2015. President Barack Obama will address the nation Sunday night from the Oval Office after a violent week in the United States that saw another mass shooting. The White House said Saturday that Obama would speak about the steps the government is taking to carry out its highest priority: keeping Americans safe. He will also update the country on the investigation into Wednesday's massacre that left 14 people dead in San Bernardino, California, carried out by two apparent followers of Islamic State, and how the U.S. will defeat terrorism. In his weekly Saturday address, Obama said Americans would not be terrorized as they upheld the values of a free and open society. The president's top law enforcement officials, including FBI chief James Comey, updated him Saturday on the investigation of the California shootings. The FBI is investigating the killings as an act of terrorism, but the White House said there was no indication so far that the killers were part of an organized group or broader terrorist cell. Obama also spoke Saturday by telephone with French President Francois Hollande, whose country is still recovering from last month's terror attack in Paris that killed 130 people and wounded more than 350 others. The White House said Obama accepted Hollande's condolences for the loss of life in California and briefed the French leader on the investigation. Earlier Saturday, Islamic State said on its English-language radio broadcast that the husband and wife were its “soldiers,” and in an Arabic broadcast it called them "supporters." But the group did not claim responsibility for the massacre. A Facebook message apparently posted around the time of the massacre by the wife, Pakistani Tashfeen Malik, pledged allegiance to Islamic State. Pledges of loyalty to IS leader Abu Bakr al-Baghdadi have been reportedly found in social media posts by others who carried out mass killings. Some Islamic State supporters posted messages on Arabic social media hailing the massacre and congratulating the killers. Some promised more attacks in the the United States. 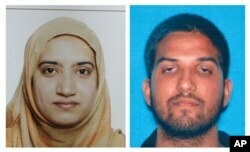 An undated combination of California Department of Motor Vehicles photos shows Tashfeen Malik, left, and Syed Farook, the husband and wife who died in a gunbattle with authorities after a mass shooting in San Bernardino, Calif., Dec. 2, 2015. Malik and her husband, Syed Rizwan Farook, killed 14 people and wounded 21 at a gathering of local government workers in San Bernardino, about an hour's drive east of Los Angeles. They also planted a pipe bomb that failed to go off before fleeing in a black sport utility vehicle. Police spotted the car in a nearby residential neighborhood, and the couple was killed in a shootout with officers. Two officers were wounded, but not seriously. Police later discovered 12 pipe bombs, bomb-making materials, and thousands of rounds of ammunition in the couple's home. Reporters and photographers crowd into the living room of an apartment in Redlands, Calif., shared by San Bernardino shootings suspects Syed Farook and his wife, Tashfeen Malik, Dec. 4, 2015. The FBI said a number of pieces of evidence had turned up indicating that this was a terrorist act, including signs that the massacre was extensively planned. Investigators were also looking at two crushed cellphones the couple apparently threw away near the site of the killings. Two attorneys representing the Farook family criticized the media for what they said was a rush to judgment that this was a terrorist attack simply because the suspects were Muslim. Lawyers David Chesley and Mohammad Abuershaid said they and their clients met with the FBI for four hours and that the family was totally shocked by the killings because, they said, the couple never showed extremist or aggressive behavior and never mentioned Islamic State. Chesley said the FBI had no "clear smoking gun" among the evidence that pointed to terrorism. Friends, family and co-workers of the couple said they had no clues about what sparked Malik and Farook to carry out their massacre. Neither had a criminal record or was on any government watch list. The Chicago-born Farook was a local government health inspector in San Bernardino. Friends said he was dedicated to Islam, cordial, liberal-minded and well-liked. He met the Pakistani-born Malik through an online dating site. The two met in Saudi Arabia and married. She came to the United States on a fiancee visa. Some of Farook's friends said he returned from Saudi Arabia a changed person. The couple were parents of a 6-month-old girl. FILE - A woman cries during a candlelight vigil for shooting victims on Thursday, Dec. 3, 2015. The FBI said it wasn't known whether anyone else in the United States or overseas was involved in the San Bernardino attack. It said a second attack might have in the planning stages, but the agency made it clear to the public and reporters hungry for information that this would be a very long, complex investigation. The weapons used in San Bernardino were bought legally. 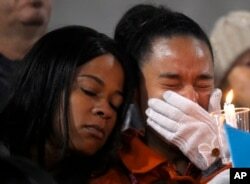 Obama said it was "just too easy" for people to buy guns in the United States. He said what happened Wednesday should spur lawmakers in Washington "to take basic steps to make it harder ... to get weapons." Senate Republicans on Thursday rejected an amendment that would have worked toward blocking suspected or known terrorists from being able to buy guns.